Like all stringed instruments, your hammered Dulcimer will in time become out of tune. Therefore it is important to learn how to tune your dulcimer. It can be challenging at first, but becomes quicker and easier with practice. How Often Do I Tune? How often you tune your dulcimer is really down to you. I personally tune mine when it starts to sound out of tune or before any performance. Newer Dulcimers need tuning more often as the strings take time to settle. Also, hammered dulcimers will need to be retuned when exposed to significant humidity changes. High humidity causes the instrument to go sharp. Low humidity causes the instrument to go flat. Remember that switching from air conditioning to heating in your home results in significant changes in room humidity. Control the humidity and you'll need to retune less often. A Hammered Dulcimer usually has 2 strings per note, (sometimes more), which are tuned separately to the same frequency to achieve the sound of one note. The number of strings used to create a single note is called a ‘course’. The more strings you have per course, and the more courses you have on your Dulcimer, the longer it takes to tune. A Dulcimer is tuned by turning the tuning pin that is located at the end of each string by using a tuning lever. Turning the pin clockwise will tighten the string making the note sharper. Turning the pin anticlockwise loosens the string, making the note flatter. I will describe the technique in depth later in this article. You can tune the instrument to different levels of accuracy depending on what you are intending to do with it. For instance, a performance will require accurate tuning, whereas a jamming session or practice session may not require your instrument to be so accurately tuned. If taking part in a jamming session you can always ask your fellow musicians to tune their instruments to your Dulcimer, as the majority of instruments, i.e guitar or violin, will take much less time to tune. Allow 20 to 30 minutes for accurate tuning. Not such accurate tuning is simply done to personal preference and can be accomplished in around 10 minutes or less. What Tools Do I Need for Tuning? This is probably the most useful device available to the owner of a hammered dulcimer. I personally consider it essential, and could not tune my Dulcimer without one. The Electronic tuner has a small digital display which allows you to see when the string has reached the correct frequency for the note that you require. This means that even the most tone deaf person could accurately tune a Dulcimer. 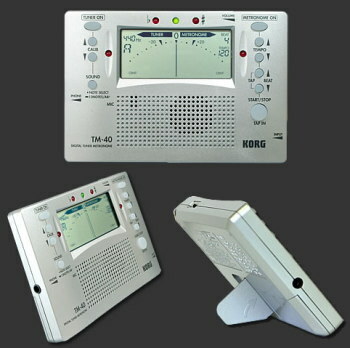 The KorgCA02 is a really good make of electronic tuner and is available to buy from the Dulcimer shop on this website. Tuning levers come in a couple of different styles: "T" Handle and "Gooseneck" Handle. Which one to use is usually a matter of personal preference. The Gooseneck gives more leverage, but some people find it allows for less fine-tuning control. The "T" Handle gives more fine-tuning control, but may not be as easy to turn for some people. Most hammered dulcimers have zither-style or harpsichord tuning pins (which are smaller than piano pins), so make sure that your tuning lever fits those type of pins. All of the Dulcimers in my Webshop are supplied with a tuning lever. Alongside your electronic tuner and tuning lever, you can also use a HD2 Shatten electronic pickup device. (Available on my website) The purpose of the pickup is to eliminate all other external noise and frequencies, enabling more accurate and easier tuning. The pickup is plugged directly into the socket on your electronic tuner and then placed onto the surface of your Dulcimer. 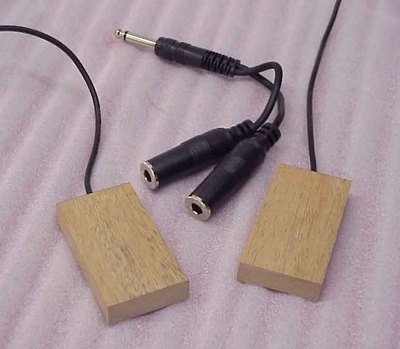 The pickup is not essential but without one, you will need to make sure you tune your dulcimer in a quiet environment. There is many a debate about the best place to start when tuning your dulcimer. From the bottom, the top, the bass bridge (the bridge on the right), the treble bridge (the bridge on the left)? Etc. To be honest wherever you start is in my opinion merely a matter of preference. By habit, I tend to start at the bottom course on the bass bridge. So how do I tune my Dulcimer? As I mentioned above, a Hammered Dulcimer usually has 2 strings per note, (sometimes more), which are tuned separately to the same frequency to achieve the sound of one note. The strings used to create a note are called a ‘course’. Each string has its own tuning pin. I will describe the tuning process for dulcimers that have 2 strings per course. The method below is using a Korg CA30 tuning device. 1) Turn on your electronic tuner. There should be 3 small lights. (2 red lights with a green one in the centre). The green light will be on when the string is in tune. Adjust the tuner settings so that the display shows 440Hz. This is Concert pitch, and all instruments in an orchestra will be tuned to this frequency. Place the electric tuner onto the surface wood of the dulcimer or rest on top of the strings. 2) Locate the lowest course of strings on the bass bridge. 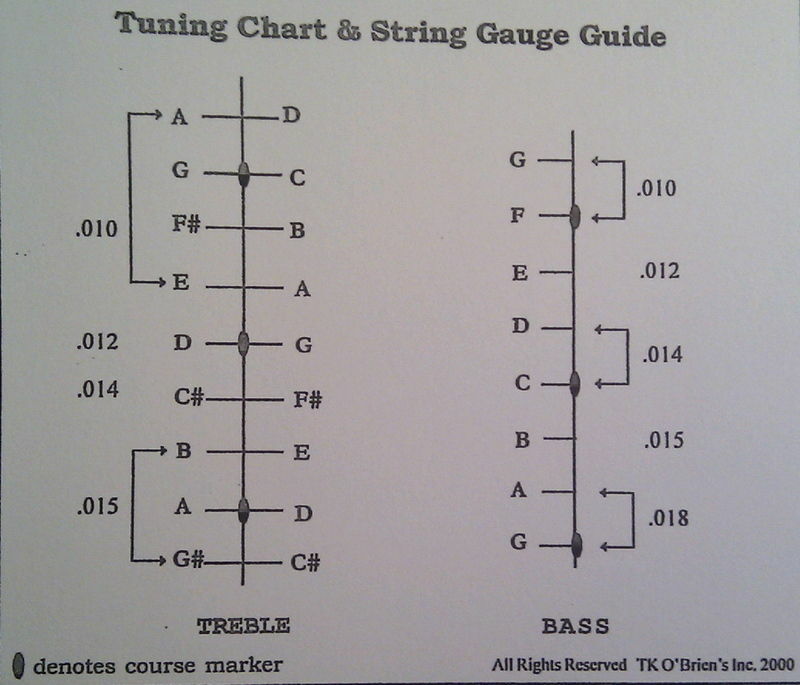 Use your tuning chart to determine which note this is. E.g ‘G’. 3) Run your finger along the UPPER string of the course until you reach the tuning pin. Place your tuning leaver over this pin (It is important to ensure you locate the correct tuning pin for the string you are about to tune. As there are so many strings it is very easy to turn the wrong tuning pin – if you turn your lever and do not hear the note change in pitch STOP! This most likely due to the fact your lever is on the wrong pin!). 4) Use your finger or a plectrum to pluck the string, as you do so look at the screen on your electronic tuner. You will notice a dial with a line that swings backwards and forwards. At the right end of the dial is a note name. If this is the note that you require (e.g tuner shows ‘G’, note required is ‘G’) you will only need to make small adjustments (see step 5). If the note shown is not the same as the note that you require (e.g tuner shows ‘F#’, note required is ‘G’), then your Dulcimer is significantly out of tune and you will need to make larger adjustments (jump to step 6). 7) You are now ready to tune the LOWER string of the course. Run your finger along the lower string of the course and locate the tuning pin at the end. (This should be the pin directly below the one you have just been turning). Place your tuning lever on this pin. It is best to tune the lower string by ear. Place your right hand on the tuning lever and use your left hand to hit both strings of the course at the same time using your Dulcimer hammer. As you do this turn the tuning lever in same direction, that you used to tune the upper string. (it is unusual for one string on a course to be sharp and the other to be flat) Listen to the sound that is produced. When the lower string reaches the same frequency as the upper string you will hear one clear tone. If the Lower string is out of tune then you will hear a buzzing/beating effect. The faster the beat the further out of tune the string is. Keep hitting the course of strings with your hammer, whilst making small adjustments to the tuning pin until the note sounds clear. 8) Repeat these steps on each course of strings. On the bass bridge. When you reach the top, move across to the Treble Bridge. 9) When tuning the strings on the treble bridge you need to tune both "sides" at the same time. Bring one side into tune using the steps above, then hit the other side with your Dulcimer Hammer. Does it sound in tune? If not make small adjustments to bring it into tune. Hit both sides and repeat until both sound in tune. Do the same for the rest of the strings on the treble bridge. 1. Tune the Bass Bridge. 2. Tune the right side of the Treble Bridge. Spot check the left side to make sure it is also in tune. 3. Play a couple of scales, arpeggios to double check you are happy with the tuning. What if I can’t get both sides of the treble bridge to be in tune at the same time? Occasionally you might come across a ‘problem’ course whereby you cannot get both sides of the bridge to be in tune at the same time. When you tune the left side of the bridge the right goes out of tune and vice versa. If no amount of tuning adjustments will solve the issue, then there are a few other things you can try. Over time the strings can cut small groves in the plastic black and white bridge markers. The string can then sometimes stick in that groove. Move the string from its resting position on the black and white markers back and forth to release any build up of tension. Retune this course and see if it has solved the problem. If it is no better, make sure the strings are equally spaced all the way along the length of your Dulcimer. You can adjust this by gently pushing the strings closer together or further apart at the hitch pins and or tuning pins. This movement slightly changes the length of the strings and will help with your tuning issues. If none of these tips work, your bridge may be out of line. This means your bridge has shifted slightly making it impossible to tune keep both sides of the bridge simultaneously in tune. If you believe this has happened please refer to the ‘bridge adjustment’ page on this website.